Known affectionately as the City of Lakes, Dartmouth sits across the harbour from Halifax, sharing its urban energy and cosmopolitan feel but with a charm all its own. 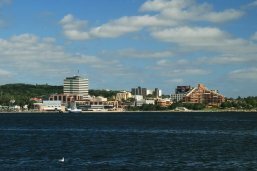 While the area is still referred to as Dartmouth, in 1996 the city of Dartmouth was united with Halifax and surrounding communities as the Halifax Regional Municipality. Dartmouth was founded a little over a year after the British had established the town and garrison of Halifax, across the harbour. In 1750, the sailing ship Alderney arrived with over 150 English settlers, who named the town in honour of the William Legge, 2nd Earl of Dartmouth and England’s Secretary of State for the Colonies. However, long before these settlers disembarked on its shores, the area was known as “Boonamoogwaddy” or “Tomcod Ground” by the Mi’kmaq who would fish and camp there during the summer months. In fact, the Mi’kmaq continued to reside along Dartmouth’s waterfront at Tuft’s Cove until 1917, when the Halifax Explosion devastated the area and its inhabitants. Dartmouth was primarily a fishing and farming community until the mid 1800s with the construction of the Shubenacadie Canal, which linked Halifax Harbour and the Bay of Fundy by way of Dartmouth’s many lakes and the Shubenacadie River. With the arrival of the Industrial Revolution, factories started to spring up throughout the town, including the Starr Manufacturing Company, famous for producing ice skates, and two chocolate factories, of which Moirs Chocolates would continue well into the late 20th century, when it was purchased by Hershey’s Chocolates. During these years, despite the close relationship between Halifax and Dartmouth, the only direct way across the harbour was by ferry. In 1752, ferry service started as simply a row boat with a sail, evolved to a horse-powered paddle ship, and included Samuel Cunard – of the famous Cunard Steamship Line – as president of the steam boat company that once operated the ferry. The Halifax-Dartmouth ferry continues to this day – albeit, with modern vessels – and remains the oldest, continuous saltwater passenger ferry in North America. However, in 1955 the ferry lost its claim to being the fastest method of crossing the harbour with the construction of the Angus L. MacDonald Bridge and again with the addition of a second harbour bridge, the A. Murray MacKay Bridge, in 1970. The city of Dartmouth continues to maintain a strong identity that is evident as you stroll its waterfront, talk to its people and relax near its many lakes. Dartmouth offers visitors a wide range of accommodations in its downtown and throughout the city. You’re sure to find accommodations that meet your needs and your budget, including bed and breakfasts, motels and luxurious hotels. If you’re looking to grab a bite in Dartmouth, you’ve come to the right place! The urban centre across the harbour from downtown Halifax offers visitors everything from family restaurants, global cuisine, celtic pubs, and romantic bistros to traditional bakeries and fish & chip shops. On Saturdays, the Alderney Landing Farmers' Market provides marketgoers with an amazing selection of baked goods, ethnic dishes, and more. When it was completed in 1853, the Shubenacadie Canal allowed ships and barges to move easily from the Halifax Harbour, through a series of locks, to the Bay of Fundy and beyond. Constructing it was an enormous undertaking, involving an army of engineers, stone masons from Scotland, local labourers and strong work horses. While much of the canal has been lost to time, you can still admire a restored section of it at Dartmouth’s popular Shubie Park, including its locks, an interpretive centre and winding trailways running alongside it. To see where the Shubenacadie Canal once connected to the harbour, head down to the Dartmouth waterfront where you can also see another restored section of the canal. Take a walk along the boardwalk, with views of the Halifax skyline and George’s and McNab’s Islands, and be sure to stop at Alderney Landing to see where Dartmouth began over 260 years ago. Another stop for those looking to explore Dartmouth’s past can be found at Quaker House on Ochterloney Street. Built in 1785, the house is a carefully preserved home of a New England Quaker family that moved to the area to hunt whales. A short distance from Quaker House is Evergreen House (c 1867). Once the home of renowned folklorist and writer Dr. Helen Creighton, who collected thousands of oral histories and songs from Nova Scotians and the Mi’kmaq, Evergreen House is now home to the Dartmouth Heritage Museum. On the outskirts of Dartmouth sits the community of Preston, which is home to many of Nova Scotia’s earliest black families. The Black Cultural Centre sits in nearby Cherry Brook and is an excellent place to learn and discover more about Nova Scotia’s black culture. See exhibits and photographs that cover the history of black immigration to the province, learn more about Nova Scotia’s famous black citizens and join in the various events and celebrations that take place throughout the year. Dartmouth is a great place for getting outside and appreciating its natural beauty on land and water. In addition to its green spaces, the City of Lakes boasts 23 lakes that provide opportunities for kayaking, windsurfing, canoeing and swimming. Lake Banook is a world-class paddling course, where regattas are often held. The city features many parks and walking trails and easy access to the unspoiled coastal beauty of the Eastern Shore.